The chaos and carnage continues on Gaia. Mycroft and Gabriel make a run for Gaia’s computer core in order to administer the antidote for the virus that is killing Gaia. Elizabeth and Armarok wage an impossible battle with Shirvais – chaos incarnate. 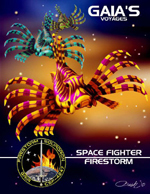 And everything finally comes to a head as Desedemona and Shirvais face off in space above Gaia as the Firestorms engage in a dogfight with the enemy. Will Gabriel and Mycroft succeed? Will Elizabeth and Armarok survive? Will Shirvais accomplish her mission of destruction? Tune in and see! WARNING: There are scenes in this episode that are rather explicit and are NOT intended for a younger audience. This episode therefore has a mature rating! This time on Gaia’s Voyages: Borask rescues Doctor Undomo when Medbay is under attack. Elizabeth, Mycroft, and Armarok go head to head against the terrorists where they meet a blast from the past. McCall, Andre, and the Redshirts hold out as the Bridge comes under fire. And Armarok and Elizabeth make a stand against Shirvais. Rating: NC-17 – This episode is especially graphic and is NOT for CHILDREN! You have been warned! Armarok has mentioned them. They were good enough to almost destroy him. They are about the only thing he fears… Now you shall see why. In this special Halloween release of Gaia’s Voyages we meet…. Armarok’s Venjari family. The crew sit down in the Captain’s garden for their weekly poker game which gets crashed by a blast from Desedemona’s past. But there is more than one uninvited guest aboard Gaia this day and a bad day quickly turns into the day from hell. Will Zeet be able to save his lady love? Will Andre and McCall hold the Bridge? Will the Firestorms’s training at Armarok’s hands pay off? Can Elizabeth, Mycroft, Armarok, and Desedemona fight off Shirvais and Grayson with the help of none other than Giacomo Casanova? The romantic escapades continue on board the Zooship Gaia. Andre duels Mycroft (with Desedemona in the driver’s seat providing tingles to strategic places) in front of the entire crew. Desedemona returns to her quarters to find a surprise from Andre and decides to take drastic measures. Gaia throws her Valentine’s Day bash with unexpected results. We learn who is the true master of LOVE on Gaia. And, Elizabeth sneaks off to her common room to confront demons from her past. Grab yourself your honeybun, a box of chocolates, and a bottle of wine to enjoy the end of the Valentine’s Day special on Gaia’s Voyages! their lady love. Who will win and what capers will result? Listen and find out! The Firestorms take a moment to have a good meal but it’s interrupted by the arrival of their new Commanding Officer. Natty and Amazo decide to sneak out of Natty’s room to help Gaia. And down in Engineering Desedemona and Zeet brainstorm ways of bringing Gaia back to life again. Will they be able to pull off a mechanical miracle or is Zeet doomed to have a complete nervous breakdown? Listen and see! Zeet shot circuits when his mechanoid staff goes on strife and appeals to Desedemona for help, Elizabeth and Thor discuss her psychic powers, Armarok and Mycroft go head to head, and Elizabeth makes Armarok CO of the Firestorms before rocking Mycroft’s safe little world. Gaia might be out of the wormhole and away from Xaphoni but she’s still stuck in the middle of nowhere with no main power. Will Zeet be able to pull a mechanical miracle and save the day? Elizabeth goes down to investigate the assassin for herself despite Mycroft’s protests and eternal frustrations. A tea party in Medbay goes not quite according to Elizabeth’s plan and Elizabeth reveals a dark secret from her past.